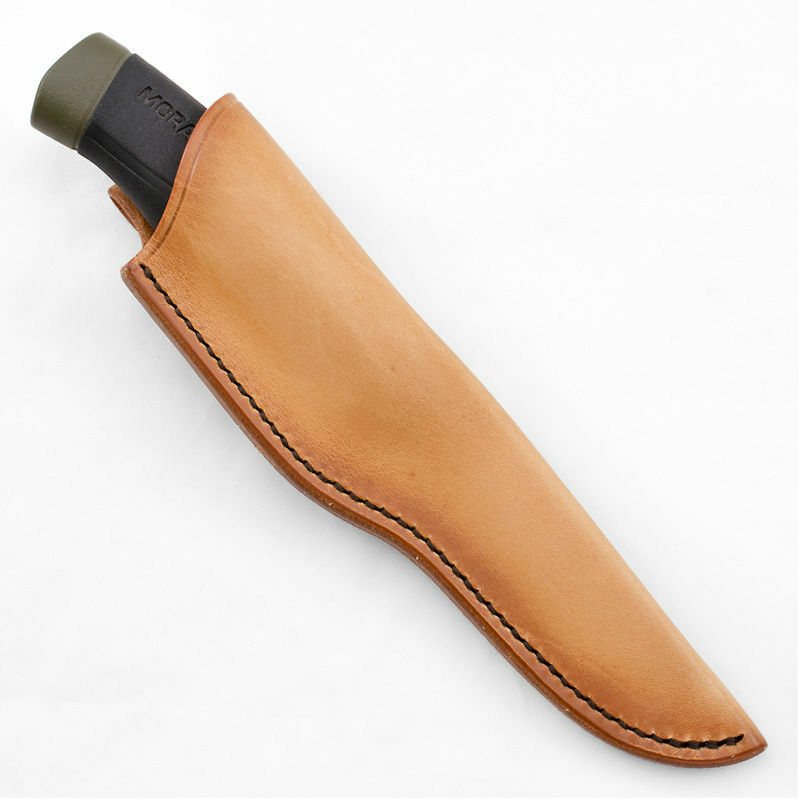 The Ray Mears Morakniv Companion Heavy Duty Knife Sheath is a handmade leather sheath designed to house the Morakniv Companion Heavy Duty Knife. 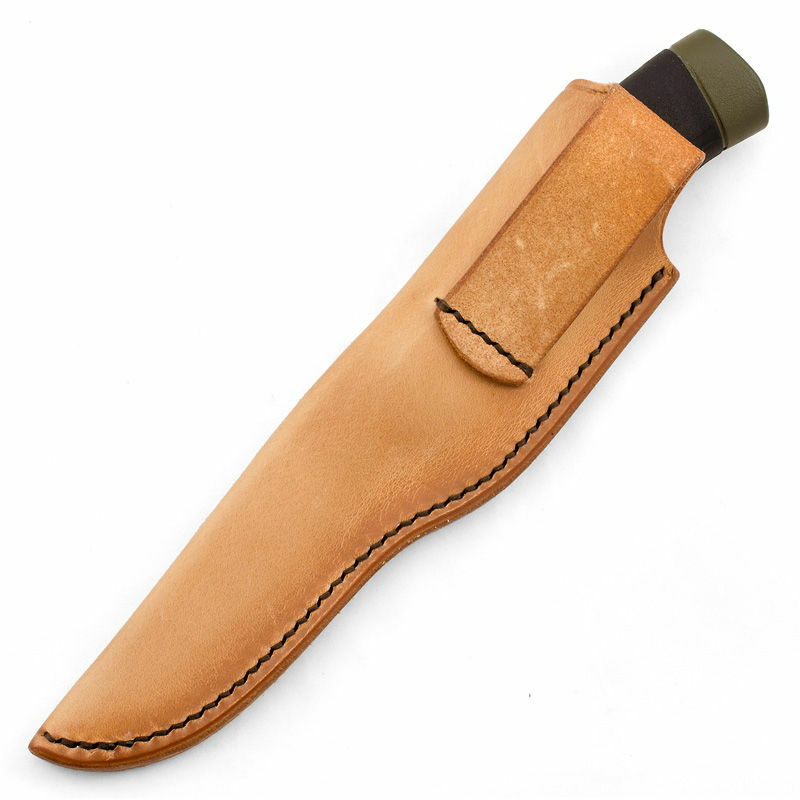 Following numerous requests from our customers, we recently made the decision to produce this custom leather alternative to the plastic sheath that is typically supplied with this knife. 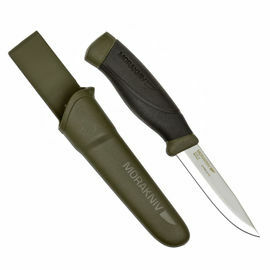 Giving consideration to the excellent value of the Morakniv Heavy Duty Knife, we have made every effort to make this sheath as affordable as possible. 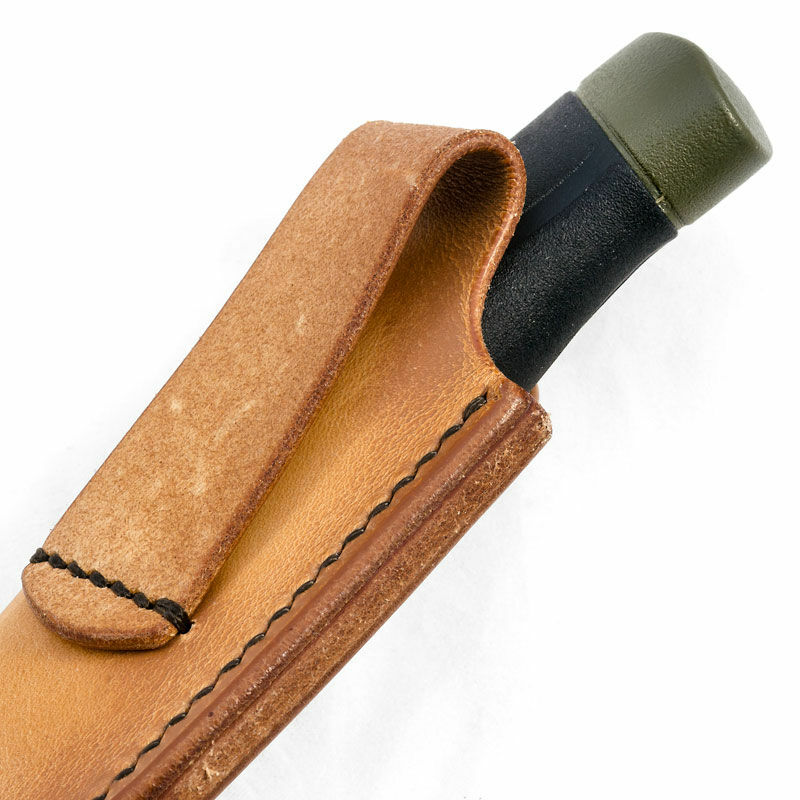 As such, the design has been pared back to a more basic belt sheath, while still being made to the high standards you would expect from any of our leather goods. 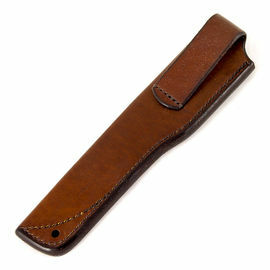 Each sheath has been left undyed, allowing the natural beauty of the leather to shine through. The resulting pale skin-tone of the leather is then darkened by the application of an oil/wax mixture during the final process of production, giving a multi-tonal effect which is darker at the edges of the sheath. 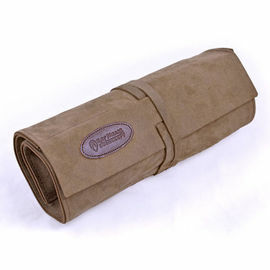 This leather will also tan like skin with exposure to light and burnish with use and handling. Many knife sheaths may look similar on the outside, but what makes a sheath do the job safely and securely is what is on the inside. The sheath must fit the knife in all particulars to prevent movement by allowing the blade to bed slightly into the welt and also provide a fit in the handle section while still allowing the knife to be smoothly withdrawn. The Ray Mears Morakniv Sheath has been designed with all of these factors in mind to provide a safe and secure fit, including generous welt that protects the stitching inside the sheath and negates the need for any rivets, which can be damaging to the blade. All stitching is done by hand in a contrasting brown braided thread and the edges are bevelled and burnished for comfortable handling. 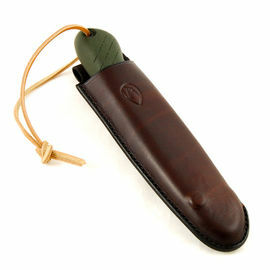 Ray Mears Leather Morakniv Companion Heavy Duty Knife Sheath is rated 5/5 based on 10 customer reviews. Excellent, high quality leather sheath for Mora HD Companion with the added bonus of being available in Left handed option for us Lefties. Thank You Woodlore team. 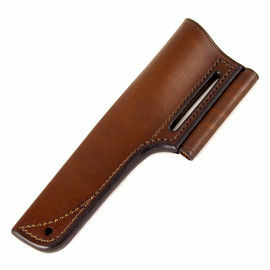 This is a high quality well made and durable sheath that will easily tolerate lots of action. There's a good thick welt of leather against which the blade edge bears when sheathed. The welt has been well finished at its outside edge, it's smoothed and polished, in keeping with the high quality previously mentioned. The fit and grip of the inserted knife is how it should be at this stage, it will loosen with use no doubt. The colour is as it shows on my PC screen and its surface is satin. If you're concerned about the colour or its tendancy to stain then application of regular leather treatments will both darken and protect it. I've chosen to treat mine with Neatsfoot Oil which accelerates the softening process also. 'You get what you pay for ' is a well used phrase; this definitely qualifies and I recommend it without difficulty. Finally, it seems useable with Mora's regular Companion also but the fit for Mora's high end 'Garberg' was less satisfactory than other aftermarket sheaths I've tried. Useful info if you have a Garberg Multimount sheath system and were considering this as a secondary option. Now my Morakniv Companion Heavy Duty Knife has a high quality leather sheath. Thanks to the Woodlore Team for such a high quality product. Very satisfied with this product. Well made and holds the knife secure but not as good quality as the Ray Mears Bushcraft Knife sheath. 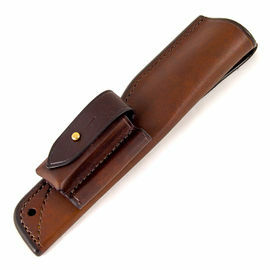 This is a beautiful simple sheath, it's well made and looks great, and will only get better the more I use it. I like the way the craft man/woman has put a thick strip of leather down the seam of the sheath to protect the stitching on the cutting edge, a nice and useful touch. It just goes to show they know exactly what is needed and what they are doing. I should also mention the knife I brought it for, it was not one of the knives it was designed for but a different kind of knife I had brought years ago and it had a plastic sheath. Thanks to Ray and the Woodlore team, for the measurement description on the site page, it allowed me to buy the leather sheath with the confidence that it would fit my knife. Yes, I would recommend this item to anyone who needs a sheath for that size knife and again the service and delivery was 1st class; arrived within 24 hours of ordering. Thank you. Fits like a glove and a lot quieter than the plastic sheath. Quality leather like all Woodlore sheaths. Really nice item. Good fit. Well made sheath that looks like it will outlast many Mora knives in the future. I really like the colour of the leather, and the biggest advantage to me is the fact that there's a left handed option. Knifemakers, take note! The Mora Knife is a trusty companion which deserves this sturdy and esthetic sheath. The sheath fits the knife snugly and securely, which is critical, but still doesn't require too much force to release the knife, which is equally important.